The Volksoper is the second-biggest opera in Vienna after the Staatsoper and one out of four regular opera stages in Vienna (the other two being the Theater an der Wien and the Chamber Opera). 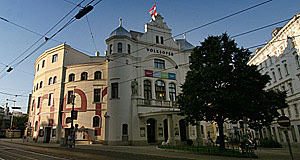 In addition to opera, the Volksoper also produces operettas, musicals, ballet and concerts. It is situated in the district of Alsergrund, just by the Gürtel Road and visible from the U6 subway line, which passes by it directly. When it was opened in 1898, the area was still part of the neighbouring district Währing. The name of the theatre back then was "Kaiser-Jubiläums-Stadttheater" ("Emperor′s Jubilee City Theatre"), since it was opened upon the occasion of the 50th jubilee of Emperor Franz Joseph I. After the opening, performances were limited to drama. After 1903, operas were being produced. To meet the changing program, the theatre was officially called "Volksoper" in 1908. In 1928, the Volksoper went bankrupt and was re-opened after a while with a new name and management. In 1938, the opera′s property and control over it was transferred to the city of Vienna. When all theatres of the city were prohibited to continue performances in September 1944, the Volksoper was temporarily transformed into one of the biggest cinemas of Vienna - it seated up to 1,550 people. Following WWII, the Volksoper was one of several substitute theatres for the Staatsoper, which had been hit by a bomb. The third opera stage of Vienna, the Theater an der Wien, shares this piece of history. In 1955, regular productions were started again. For a period of five years between 1991 and 1996, the ensemble of Volksoper and Staatsoper was the same, but the program of both stages was independent from each other. This was changed soon, though, and since 1996, the Volksoper is fully independent from the Staatsoper again. Attractions nearby include the power plant of Spittelau, which has been decorated by Friedensreich Hundertwasser; the Palais Liechtenstein and the Studelhofstiege.